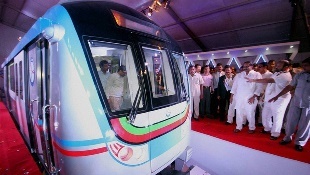 “We are planning to launch the metro service on Telangana formation day, which is June 2. We are working out the dates with Prime Minister Narendra Modi and chief minister K Chandrasekhar Rao. While it is almost confirmed that the train would be launched in June, we will announce the dates shortly,” the minister said at a press conference convened to announce the 100-day action plan for the development of the city. Meanwhile, as part of the 100-day plan, the government would leverage technology to achieve development, KTR said. “The chief minister has given us a mandate that we must put in place such an efficient system that it should automatically get rid of corruption when issuing clearances. We will adopt technology to achieve this,” he said in his first press meet after taking over the MA&UD portfolio. Last week, during a review meeting of the MA&UD ministry, KTR had announced that the government would come up with a three-phase plan for city development – 100-day plan, three-year plan and five-year plan. “We are hereby keeping our promise to announce the first phase. We will come again after 100 days with a progress report,” he said. However, the TRS party’s main poll assurances of building 1 lakh two-bedroom houses, a dedicated power island for the city and three hospitals were glaringly absent from the action plan. “Those things come in subsequently. The state government would allocate funds for the two-bedroom house scheme in the budget next month,” he said.